Because our little boy was preoccupied with his Dad’s iPad, hubby and I found an opportunity to have another dinner date, just the two of us, last Sunday. Hubby suggested 8 Spices Thai Cuisine simply because he missed eating there. We ordered Lamb in Red Curry and Grilled Squid plus Frappe and Ripe Mango Shake. This was the first time we ordered this meat dish. 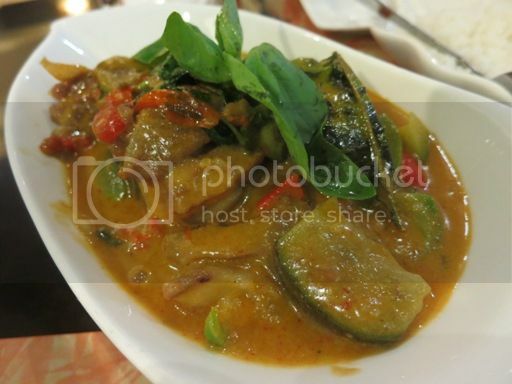 It has lamb meat, kaffir lime leaves, young eggplant and bell peppers with red curry paste and coconut milk. The meat was so tender, the sauce thick and tasty, and it had just the right amount of spiciness like we requested. It was delightful! We also enjoyed eating this because the squid was soft, not rubbery, which means it was cooked right. This was served with two sauces (tamarind sauce and spicy vinegar sauce); the tamarind sauce was very good! 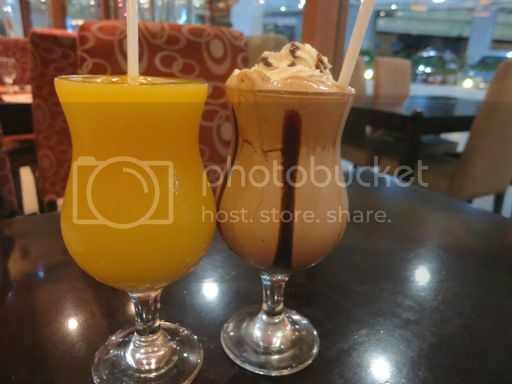 Hubby liked his Frappe, and I was content with my Ripe Mango Shake. Because what we were eating was delicious, we couldn’t help but order an extra serving of rice. There goes my diet! No dieting during December daw, Tetcha! The lam curry looks delicious..I am a fan of curries! 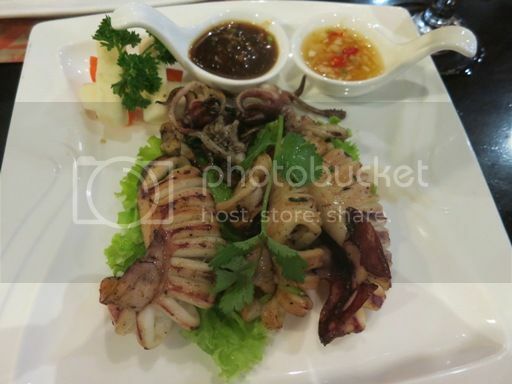 I don’t eat squid but it looks so appetizing and yummy! It made me crave.